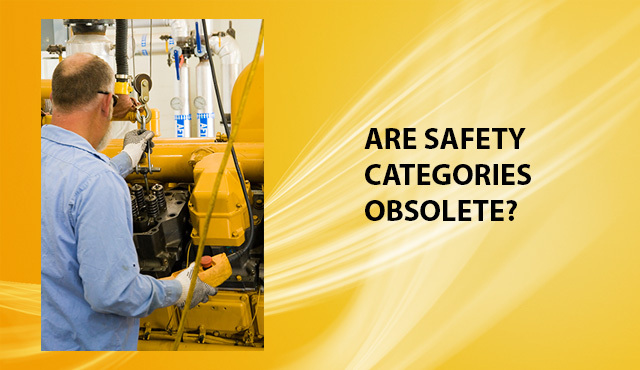 THINK SAFETY, TALK SAFETY: Are Safety Categories Obsolete? Have you heard that Safety Categories are a thing of the past? That changing international standards have rendered Safety Categories redundant since the start of 2012? And that all new safety control systems for machinery must be designed to Performance Levels (PL) or Safety Integrity Levels (SIL)? However, Australian Standard AS 4024.1501 is a current machine safety standard where safety control systems can be designed to a Safety Category. So if you are comfortable using Safety Categories, you can continue to use this standard. It is true that AS 4024.1 will eventually be updated to reflect current international standards, but AS 4024.1501 will remain unchanged for at least the next 3-4 years. In my opinion, for simple safety systems, (i.e. systems using devices such as safety relays), Safety Categories is a good option that will result in a high level of integrity. If software is being designed, I would recommend following the software lifecycles available in IEC/AS 62061 or ISO 13849.1. However, be aware that at some stage in the future our Australian Standards will transition to these probabilistic methods, but not in the immediate future. When AS 4024.1501 is eventually changed to reflect the changing international standards. What will happen with our current safety systems that are designed to meet Categories? Will we have to re-evaluate and update our safety systems and Risk Assessment's? IEC 62061 is already adopted as an Australian Standard, AS 62061, since 2006. This Australian standard can be used if the designer wants to design their system to SIL. As for ISO 13849.1, the most likely way forward is to adopt this standard as a new part of AS 4024.1 and run this in parallel with the current AS 4024.1501. This would allow designers to make the decision if they want to design with PL or CAT, this also mimics the transition process that occurred in Europe. This possible change to AS 4024.1 will potentially go to public comment later this year. It would be good to know what international standards have already been adopted as Australian standards around machine safety and manufacture. This would help when dealing with European and international vendors and trying to get them to design and build to Australian standards. This will become clearer in the next revision of AS 4024.1. Each part will have a preface that will specify the equivalent international standard. In the next revision, all AS 4024.1 parts will be direct text adoptions of their international equivalent.